2.2. What can textile electrodes monitor? 2.3. How do textile-based electrodes and sensors work and what can they measure? 2.4. What textile-based actuators are (or can be) used for in health applications? Smart Textiles and Their Applications outlines the fundamental principles of applied smart textiles, also reporting on recent trends and research developments. Scientific issues and proposed solutions are presented in a rigorous and constructive way that fully presents the various results, prototypes, and case-studies obtained from academic and industrial laboratories worldwide. After an introduction to smart textiles and their applications from the editor, Part One reviews smart textiles for medical purposes, including their use in health monitoring, treatment delivery, and assistive technologies. 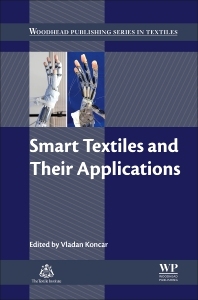 Part Two covers smart textiles for transportation and energy, with chapters covering smart textiles for the monitoring of structures and processes, as well as smart textiles for energy generation. The final section considers smart textiles for protection, security, and communication, and includes chapters covering electrochromic textile displays, textile antennas, and smart materials for personal protective equipment. Professor Vladan Koncar is head of research at ENSAIT and director of the GEMTEX research laboratory. He has authored more than 200 scientific articles, including journal papers, book chapters and conference proceedings.